The 2018-19 National Hockey League regular season is fast approaching, and the time for season previews is upon us. The vast majority of people agree that, barring some sort of biblical catastrophe, the Toronto Maple Leafs will make the playoffs. What’s definitively less certain is where they’ll qualify. Will they snag a divisional position? Might they even win the Atlantic? Or will they have to console themselves with a wild-card spot? Even more importantly, how far will the Maple Leafs go once they get to the postseason? 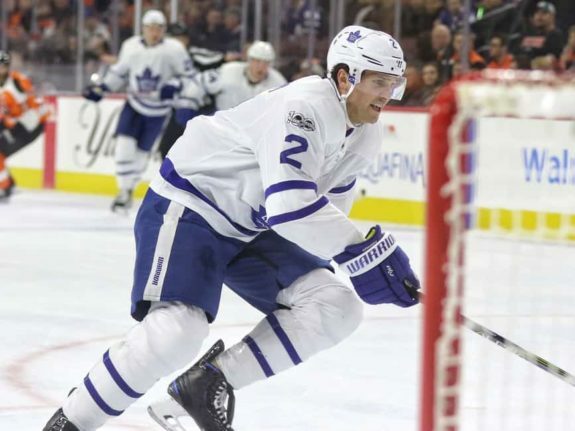 Here are three x-factors (plus one honourable mention) that could well determine the trajectory and eventual outcome of the Maple Leafs’ season. Maple Leafs Forwards: How Will New Look Look? Everyone knows the Maple Leafs scored the free agent of the summer, landing former New York Islander John Tavares – on a relatively team-friendly deal, to boot. Less talked-about is the fact the Maple Leafs’ forward group as a whole will look – and play – drastically different in 2018-19. Over the summer, Toronto said goodbye to, amongst others, James van Riemsdyk, Leo Komarov and Matt Martin. The Maple Leafs, already not a tremendously hard and heavy team, style-wise, seem to have become even less so. Now, this isn’t the 1970s, where teams quite literally tried to run each other out of the building. But physicality is still critical to the game of hockey – and not just in terms of hits. Take power-play specialist van Riemsdyk, for example. Using his 6-foot-3, 217-pound frame, van Riemsdyk has long been a premier net-front presence in the NHL. After tallying a career-high 36 goals in 2017-18 – many of them from dirty areas, van Riemsdyk signed with the Philadelphia Flyers this past offseason. Or, how about the lovable Komarov, who signed with the Islanders? Sure, offense wasn’t his strong suit and yes, he certainly wore down under head coach Mike Babcock’s unusual distribution of ice time, but Komarov always provided a certain measure of abrasive pestilence. This is not to say the renovation of the Maple Leafs’ forward corps is for the worse. Simply put, the Maple Leafs parted ways with a number of players used to playing a harder sort of game. It will be interesting to see the new style of play the Leafs employ, as well as what happens when other teams try and test their resolve – particularly come playoff time, when the officiating becomes significantly laxer. Of course, if the Maple Leafs end up having the puck the whole time and skating circles around the competition, I’m not sure this really matters. Maple Leafs Defense: Better or More of the Same? For all their free-agent triumphs, the Maple Leafs spent the entire summer not getting better in the one area they needed it most: Defense. Jake Gardiner and Morgan Rielly are very good defensemen. After that, it’s a whole lotta who knows. After very clearly wearing down as 2017-18 progressed, has Ron Hainsey fully recovered? Equally important, has Babcock learned his lesson? All eyes will be on the Maple Leafs’ coach to see if he’ll better manage the veteran’s minutes. A well-maintained Hainsey, who’ll be 38 in March, would be a stable, steadying presence in a defense corps that skews young and adventurous. However, if Babcock runs him into the ground again, he’ll be scuttling one of his more valuable assets. Next, can Nikita Zaitsev return to the form that impressed so many back in 2016-17? Equally important, will he begin justifying the seven-year, $31.5 million ($4.5 million per season against the cap) contract his rookie performance earned him? A bounce-back season would stabilise the Maple Leaf blue line’s suspect right side and satisfy capologists everywhere. On the other hand, more of the same from Zaitsev might prompt a major change, as the Maple Leafs would not only need yet another defenseman on the right side, but also a way to rid themselves of Zaitsev’s contract, which simply wouldn’t be cost-effective for a soon-to-be cap-strapped team. After NHL auditions last season, are Andreas Borgman and or Calle Rosen ready for prime time? Is Travis Dermott more than just a flash in the pan? How about Justin Holl? Is Kontinental Hockey League import Igor Ozhiganov ready for the NHL? 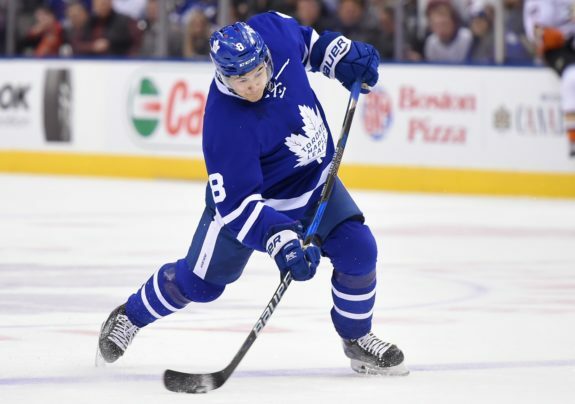 Will Connor Carrick ever stop blowing his chances? If most or all the Maple Leafs’ defensemen adhere to – or rejoin – their projected trajectories, the team’s back end has every opportunity to be just fine – perhaps even good. If not, it might be another long, long year for Toronto’s goaltending battery. 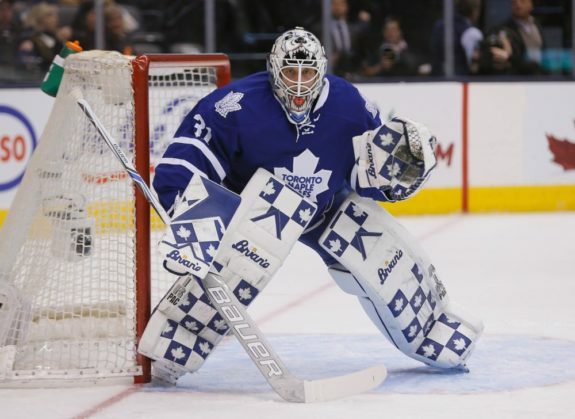 Maple Leafs Goaltending: What’s the Backup Plan? Perhaps the most interesting personnel decisions concerning the Maple Leafs will come in the goaltending department. Obviously, there’s the three-way battle currently ongoing behind starter Frederik Andersen, between incumbent Curtis McElhinney, and Toronto Marlies standouts Garret Sparks and Calvin Pickard. Regardless of who the Maple Leafs choose as their backup, they risk losing one – or both – of the others to waiver pickups (though not necessarily immediately), or sub-par trades. Needless to say, they’d better get it right. McElhinney has played in 32 games during his two seasons with the Maple Leafs (25 starts), racking up 17 wins, four shutouts and a very impressive .925 save percentage (including .934 in 2017-18). On the surface, then, the Maple Leafs would be hard-pressed to remove him from the role. That said, McElhinney is 35 years of age, has had a very small sample size in Toronto and, even including his last two seasons, only has a career NHL save percentage of .909. Even if McElhinney has truly figured things out, at this late stage of his career, I’m not sure it’d be wise for the Leafs to risk their puckstopping future for a small – and very temporary – measure of familiarity and comfort. Meanwhile, Sparks, winner of the Aldege “Baz” Bastien Memorial Award as the American Hockey League’s most-outstanding goaltender, was tabbed as the heir apparent to the Leafs’ backup role. Sparks played in 43 games with the Marlies last season and absolutely dominated, finishing with a record of 31-9-2, a .936 SV% and six shutouts. He then went 14-5 in the playoffs, registering a .915 SV% and two more shutouts en route to a Calder Cup championship. It’s clear Sparks has nothing more to prove in the minors. The fact he’s Toronto-drafted (Seventh Round, 189th overall in 2011) and developed likely only helps his case (rightly or wrongly). That said, success in the AHL doesn’t guarantee success in the NHL. So, even with Sparks’ impressive numbers for the Marlies, there are no guarantees he performs similarly for the Maple Leafs. 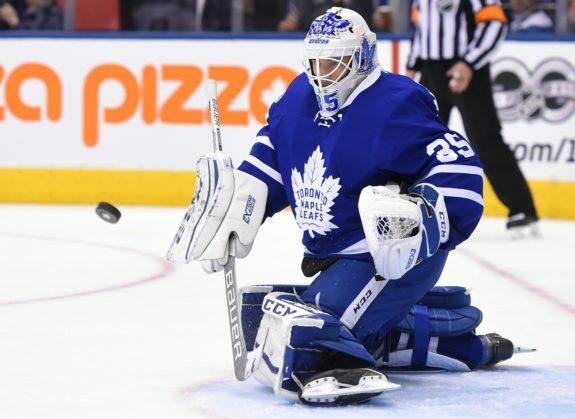 Unfortunately, his 17-game NHL audition back in 2015-16 – the only NHL games to his credit, wasn’t terribly impressive (6-9-1, with an .893 SV% and one shutout), though it should be noted that was also the Maple Leafs’ last-place season. More to the point, his recent exhibition performances haven’t exactly gone to plan, either. There’s no getting around it, choosing Sparks would be a big risk for the Maple Leafs. And then there’s Pickard, who seems to be the odd man out. Sparks’ batterymate with the Marlies last season, Pickard shared the Harry “Hap” Holmes Memorial Award (goaltenders with 25 or more games played on the team allowing the fewest goals against) with his more decorated counterpart, and put up a 21-9-2 record, with a .918 SV% and one shutout during the regular season. Pickard also has a decent body of NHL work to his credit, including spending a season as the starter for the (then-woeful) Colorado Avalanche. All told, in 87 NHL games (75 starts), Pickard has a career save percentage of .913, which would likely be higher were it not for the Avs’ historically abhorrent 48-point showing in 2016-17. On the other hand, Pickard seems to be the least-preferable option to the Maple Leafs. With incumbent McElhinney having had a career-best season, and heir apparent Sparks possessing homegrown pedigree and coming off a highly decorated AHL campaign – not to mention a Calder Cup victory, Pickard decidedly looks to be the odd one out in Toronto. He also might be the Maple Leafs’ most predictable option. Honourable Mention: Will Babcock Play His Backup(s)? On the topic of goaltending, Babcock has started Andersen 66 times in each of the past two seasons. That’s too much in today’s NHL. 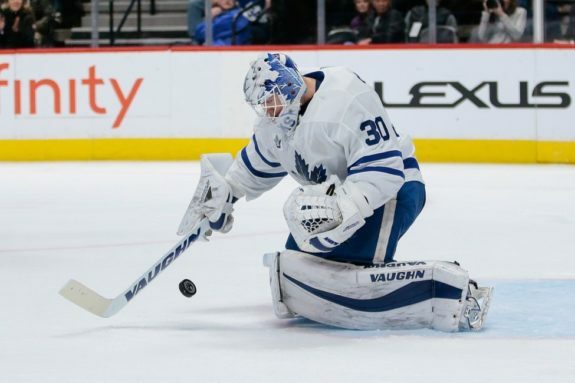 Regardless of whether this overreliance came as a result of overestimating the durability of starting goaltenders, a lack of trust in his backup netminder and or something else altogether, it’ll be worth keeping an eye on how Babcock distributes his goaltenders’ starts this coming season, and how it affects the Maple Leafs’ ultimate outcome. Regardless of who gets the job, more of the same when it comes to the backup’s deployment just won’t cut it. Watershed Season for Maple Leafs? The 2018-19 campaign presents a tremendous opportunity for the Maple Leafs to truly join the ranks of the NHL’s elite. On the other hand, there’s enough risk and uncertainty surrounding the team to make even the hardiest of optimists wary of buying in completely. How the Maple Leafs organisation – from the players, to head coach Babcock, to first-year general manager Kyle Dubas – handles this uncertainty will speak volumes about the direction of the franchise. 2018-19 could well be the turning point – for good or for bad – for this Maple Leafs build.